Residents of Cheltenham are being urged to recycle their used cooking oil at the Swindon Road recycling centre, for recovery into renewable electricity. Currently, UK water companies are spending an estimated £15 million each year on clearing drains blocked by the improper disposal of cooking oil into sinks. 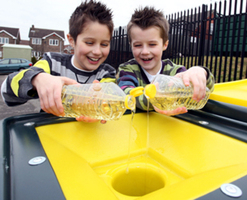 By recycling cooking oil we are also diverting as much as possible from costly landfill. In a new scheme launched by Cheltenham Borough Council in partnership with Ubico Ltd, it’s environmental services provider, used cooking oil is collected in a safe and environmentally friendly fashion. Once collected by eco-firm Living Fuels, the waste oil is taken to their state-of-the-art facility, where it is recovered through a natural process that involves no heat or chemicals, into an environmentally friendly bioliquid. This bioliquid is then fed into the National Grid at times of unexpected power demand. Cheltenham Council’s recycling rate stood at 46% in the 2011/12 year, with an aim to reach 60% by 2020.